I’m thrilled to have been nominated for a Very Inspiring Blog Award by Julie Stock, whose wonderful blog My Writing Life can be seen here. Thank you, Julie! My debut novel is being published at the age of 58. It really is never too late! 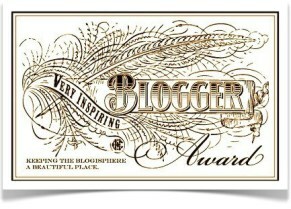 The eagle-eyed amongst you will notice I have only nominated 7 other bloggers. I’m not too hot on maths, but even I can see that if every blogger nominates 15 others we will shortly run out of bloggers. That’s my excuse anyway, I hope I will be forgiven. This entry was posted in Awards, Writing. Bookmark the permalink. That’s no problem, Sally. I know how busy everyone is! One of these days I’d love to write a rural romance. All I need is more time!